PTS Panels eGlucose Test strips provide a quantitative measurement of glucose in fingerstick whole blood. They have a measuring range of 40-600 mg/dL. The eGLU test strips are intended to be used to quantitatively measure glucose in whole blood. Glucose measurements are used in the diagnosis and treatment of carbohydrate metabolism disorders. 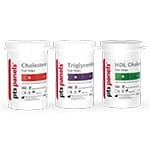 The PTS Panels eGLU test strips are for in vitro diagnostic use. 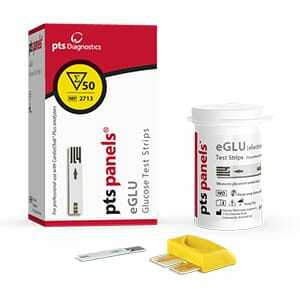 The PTS Panels eGLU test strips are currently marketed for professional use. Glucose is a sugar that is the major energy source in the body. Maintaining appropriate glucose levels is very important. This system may be used to measure glucose levels. A MEMo Chip® is provided with each package of test strips and must be properly inserted into the analyzer before any test can be run. The MEMo Chip contains test name, calibration curve, lot number, and test strip expiration date. 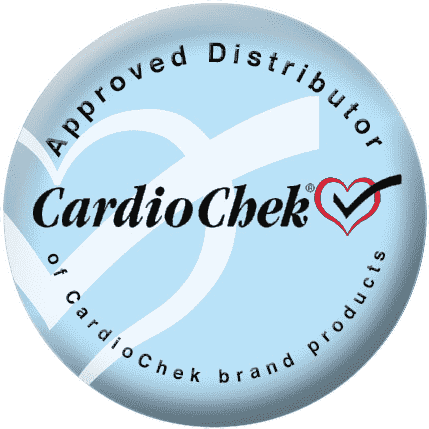 After the test strip is inserted into the analyzer and blood applied to the test strip, test results are displayed in about 10 seconds if testing eGLU only, or about 2 minutes if, for example, run in conjunction with a PTS Panels Lipid Panel test strip. Sample Process: use lancet to create small blood drop (approx 5 µL) then touch blood drop without use capillary to eGlucose strip.